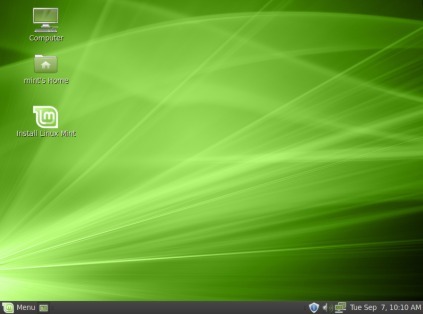 Linux Mint Debian Edition(LMDE) : available for download! Linux Mint Debian Edition has released Today! (sep 07,2010).LMDE is a rolling distro based on Debian and it has claimed to be more faster and more responsive than other Linux distribution e.g Ubuntu.LMDE comes with a Debian base with GNOME as Default Desktop(Although you can choose other desktop if you want(list of other supported desktops are given below)) and it’s rougher than other distros so it may not be so much user friendly but it is under continuous improvement. Actually it represents an alternative,with almost same desktop functionality as ubuntu or other Linux distribution, but with a different base.So there is a difference in hardware support and compatibility between LMDE and other Linux distributions. Linux Mint Debian Edition(LMDE) comes with Software Manager for managing favorite applications efficiently.The Default desktop is GNOME but if you wanna try other desktop then it’s very simple.The other supported desktops are KDE,LXDE,FluxBox,XFCE.Go to it’s official website for more details.